The information contained in these Frequently Asked Questions (FAQs) is intended for general guidance only and should not be relied upon as ‘legal’ of ‘professional’ advice. To the fullest extent permitted by law, Capital Commercial Business Sales makes no representations or warranties (expressed or implied) in relation to the information, including its accuracy, currency or completeness. The information provided in the FAQs does not constitute professional or legal advice, nor is the use of any third party resource an endorsement of the information contained in the FAQs provided. It is recommended that you obtain appropriate professional and/or independent legal advice to ensure that the material provided here is relevant to your particular circumstances. To the fullest extent permitted by law, Capital Commercial Business Sales, or its employees do not accept any liability for any reason, including without limitation, liability in negligence, to any person for the general information which is provided in the FAQs, or in respect of anything, including the consequences of anything done, or not done, by any such person in whole or partial reliance upon the information.' Thank you from the team at Capital Commercial Business Sales. Thank you from the team at Capital Commercial Business Sales. We have been told by an interstate broker that there are thousands of Chinese and foreign buyers wanting to buy businesses to gain residency citizenship is this accurate? The Australian Government has a broad range of Business migration visas that require newly arrived migrants to start or purchase a business in Australia. Could we observe the business before making a decision about buying it? With previous sales, we have facilitated observation periods. This is when a buyer comes and examines the business for a longer period, commonly 5-10 days. In retail and hospitality businesses, the observation period usually involves the buyer watching the operations for the whole day to try and ascertain the sales volume and business processes. Most business sellers are apprehensive about allowing a buyer to use an observation period. Nevertheless, handled correctly and with certain conditions in place an observation period can be a beneficial process for buyer and seller alike. What we often find is that a buyer initially requests a two week period and after several days they have confirmed what they wanted to know. PEBITDA is acronym commonly used by business brokers and at Capital Commercial Business Sales it's frequently used. The reasons that we use PEBITDA is to try and help buyers fully understand the owners profit and benefits generated from the business. This helps buyers compare opportunities using a consistent profit value. PEBITDA is an extension and slight variation of an accounting terminology - EBITDA; Earnings before interest, taxes, depreciation and amortisation. The reasons buyers and investors use EBITDA to try and understand a more accurate operating profit result of a business/investment opportunity. Interest expense varies from business to business and doesn't relate to operations of the business; this also applies to depreciation and amortisation expenses. adjustments - this relates to expenses that are not operational and relate to the proprietor. So PEBITDA would be all the wages paid to the owners, plus these costs added back. So if two owners work 90 hours between them and the PEBITDA is $250,000 you have a clearer idea of what the profit result is for your effort. In using the above example of the $250k PEBITDA, some buyers who are looking to operate the business under management might factor replacement wages for staff to perform the 90 hours at $120,000 and then determine the EBITDA (with adjustments) to be $130k. An add back is an expense that is added back to the profit/loss of the business for the purpose of showing a more accurate reflection of the earnings that the owner has generated from the business. What types of add backs are commonly applied? Adjustments to owner’s compensation: some owners pay themselves above market value this can also include, superannuation and bonuses. A buyer may not necessarily spend that rate of pay to themselves or a replacement employee. - Family members or associated persons on the payroll. - Travel, meals, entertainment for personal use, not business purposes. Lawsuit settlements and other legal fees: These payments can be another example of a legitimate add back, assuming these sorts of payments are truly rare and extraneous for the company. Rent of Facilities at Prices Above or Below Fair Market Value: Many businesses pay rent for the space they occupy. It is often the case that rent is arbitrarily set above the going market rent. PEBITDA would be adjusted upwards by adding back the arbitrary, non-arms-length rent and subtracting the true market rent. Depreciation: This is a non-cash expense incurred by a business. Interest: This is a non-operating expense incurred by a business and is added back to better reflect earnings. One common strategy used by business to reduce the reported profit is to claim non-operational expenses. Some owners might claim phones, vehicles, home office expenses and related expenses like travel. Is stamp duty applicable when buying a business in the ACT? No, is the short answer. However, in some case where the sale/transfer of land or property occurs as a result of the sale of business, then stamp duty may apply to the land or property component. Do you pay GST when you buy a business? Most business sales are GST-free. The reason that most business sales are GST-free/exempt is that the business being sold is a going concern. To meet the criteria outlined by the Australian Taxation Office (ATO) of a going concern, it means that the business to continue in operation up until sale and straight after the transfer of ownership. To fully understand and read more please visit; ATO Understanding GST on a business purchase. Who prepares the contract for sale when we reach agreement? The sellers solicitor in almost all circumstances prepares the contract for sale. Please note that we wouldn't be party to a transaction that didn't involve independent and professional legal representation for both buyer and seller. Once we have agreed on all the sales terms and conditions, we will prepare a sales advice; alternatively, described as heads of agreement. The sales advice covers things like the amount paid for the business, asset values, handover and trading restrictions. The sales advice will be sent to both lawyers and will prompt the sellers solicitor to prepare the contract. What business structure can and should we use when buying the business? Each structure type has its benefits, costs, and strengths. We recommend that you speak with a business accountant about determining what structure is best for you. What is the big picture for the business? Do you plan to grow the business? Franchise it? Open more outlets? Will you need to raise additional capital in the future? Will the business be asset rich, and if so what is the best way to protect those assets? When you decide to get out of the business how will that happen and who will take over? What are current income arrangements within the family? If the business is to be controlled by one person what are the contingencies in the case of death or incapacitation? What are the most tax productive solutions while maintaining the strategic objectives of the business. We highly recommend that you seek advice from a suitable qualified legal and finance advisor about the best entity for your business. Can you recommend a Canberra based business accountant for us? We are happy to provide a list of accountants that other buyers and sellers have recommended in the past. We accept no accountability or responsibility for the reliability or accuracy of the advice provided. Finding a lawyer that can provide advice and representation when time comes to buy? The below table is a list of lawyers that previous clients have used. Capital Commercial Business Sales is not accountable for the service and advice provided. Will our names be disclosed to the business seller when we register interest in a business? Yes. As business sale agents we have a legal duty and a fiduciary responsibility to disclose the names and dealings with all buyers. We will not provide your contact phone and email address to the seller without first disclosing to you the buyer that we intend to do this. If we buy the business do we take over the liabilities/debts? In the vast majority (95%+) of business sales, buyers buy the business assets but not the entity that owns the business. The best example of this is that of a company or trust that owns and or controls the business. As a buyer, you are not buying shares in the company; rather you are entering into an agreement to purchase the business assets. So when a buyer purchases the assets of the business, the liabilities should not be transferred or carried over to the buyer. Many buyers read the balance sheet in the financial statements and see loans and obligations and are concerned that they will inherit those debts and commitments when they buy the business. This should never happen in a conventional business sale process. The buyers solicitor should search the assets that are being transferred/purchased with the business sale to ensure that they are unencumbered and can be freely assigned from seller to buyer through the business sale process. Some sales require the assignment of works in progress or agreements with clients, which can require the consent of parties. Some sales require the sale of shares in a company (5% of sales) his type of sale process is different to the traditional business sales process and commonly requires the directors (selling) to provide undertakings and warranties relating to the history and activities of the company being purchased. How is an asset list created? How are prices for assets set? Can you please explain the differences between intangible and tangible assets? 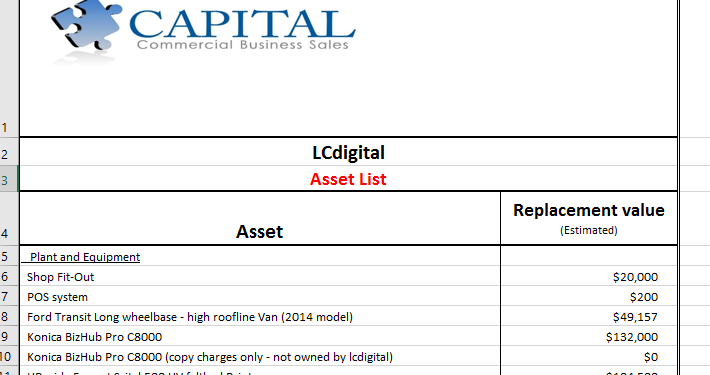 A guide to completing your asset list with Capital Commercial Business Sales. What is an asset list? An asset list is a detailed written list of all the assets with dollar values. The list should include both tangible and intangible assets (explained in greater detail below) that will be transferred to the buyer when they purchase your business. By omission, the asset list also indicates items not included in the sale. The asset list is not an accounting document; it is a sale tool and is primarily used to demonstrate and defend value to buyers. Save time and money having by having your asset list prepared before you go to market. In almost all cases a business sale is achieved by both seller and buyer executing a business for sale contract. The contract is in most cases drafted by the seller's solicitor. All the assets to be transferred should be written in the contract. It saves time and money to have that list ready to go and available for your solicitor as soon as you reach the agreement with the buyer. When drafting the sale contract, your solicitor may need to make adjustments and changes to the assets in the contract as items may have been replaced or added during the marketing campaign. Essentially there are two types of assets, tangible or intangible assets. Our goals when marketing and selling your business are to present as many assets as possible, with accurate values which can be justified to a buyer. Business furniture Desk, chairs and cupboards. Exclude any personal items that you will not be providing as an example; family desk. Fixtures and fittings or fitout. Plumbing, lighting, air-conditioning and partitions. Also things like product displays. Be certain that the improvements or assets are not owned by the property owner. Equipment Fridges, ovens, computers and anything that is used by the business that will be transferred to the new owner. Items that are in production that have not been finished. If you were a carriage builder and there were 5 completed carriages that you were going to transfer to the buyer with the sale. It’s important not to confuse stock with inventory. Stock are the products sold on a daily basis and inventory is considered to be the materials used to produce finished goods. This would include any vehicles that are to be transferred. If property is going to be included with the sale. Menus provided to customers. Signs fixed to buildings. Artwork placed in offices. Helping you set the values of tangible assets. Tangible assets are probably the easiest items to set a value for, because you should be able to provide evidence of similar items that are for sale. In many cases, both buyers and sellers can even find comparable items for sale through equipment distributors, equipment websites, suppliers and other used-equipment outlets, which can help establish current market values. If you cannot find a comparable item and or value, then we ask you to estimate the value of those assets. This process should take into account what the fair market value to replace that item is, and values that we can defend when working with a buyer. It can sometimes be difficult to attribute a value to these types of items. Ensure that the values are defendable and reflect how the new owner will benefit from owning these items. Files provided at settlement. You can use the cost replacement principle. A foundation that is often used when determining these values is what the cost is to create today. Let's assume that the seller proposes to transfer a customer database that contains 5000 customer records that include contact details and customer history. A value of $10 per customer could be attributed based on the cost to generate and record the customer details. In this case, the total value of the database would be $50,000. Development and content investment and website ranking placement can be used to assign value. In addition to ranking and development costs, the number of leads generated organically through the site can assist in determining value. Phone numbers 1300 and 1800 numbers and in many cases for sole trader businesses mobiles attached to the business. Business names This should include all the business names that are being offered with the sale. Many buyers are unaware of the time and resources allocated to create these systems and manuals. Please ensure that you outline the total number of different types of manuals for example Procedure Manuals x 24. An example of these types of intangible assets could be technology that you have developed or have access to that will be transferred with the sale. This could include prepaid licences or ownership of software licences. Helping you set the values of intangible assets. Intangible assets can be harder to set values for because many of these items are proprietary and unique to your business. Having a considered rationale about how you determined the value of these assets is important. Measuring the businesses benefits from owning the asset is also a good way of arriving at a value for individual items. A good example of measuring an economic benefit could be the sales or leads converted from your website or generated through your Facebook page. These leads are measurable, have value and assuming all remains constant should generate revenue for the incoming owner. If you are struggling to determine values for your intangible assets talk to your business broker, or accountant for guidance. How to complete the asset list. Your business broker or business information writer will email you a blank copy of the of the excel spreadsheet template. All you need to do is simply type in the item description in the asset column and the replacement value in the corresponding column. Q: Can we just use the deprecation schedule in the financial statements? A: Commonly, the deprecation schedule will not accurately reflect all the assets and the replacement or market values of the assets that are being offered for sale. Q: What do we do if we cannot determine the value of assets? A: In most instances you will be able to determine a fair market value using open sources like price lists and third party websites. If you are struggling to determine value, then ranking is one option. Ranking the values against other similar assets. You can also call your broker to discuss it. Q: How detailed should the list be? A: Well that depends on the business and the total scope of the assets being offered with the sale. If you’re a restaurant its advised not to list every type of cutlery being sold e.g 45 knives and 64 spoons, but rather group certain types of assets like cutlery. The main principle to observe is that this lists purpose is to defend the value of the business. Therefore, the more comprehensive and reflective of true value, the better. We have had some Asset Lists go over 3 pages. Q: How should works in progress, accounts receivable or work contracted but not invoiced yet be managed? A: In most conventional business sales in Australia (95%+) the entity that owns the business and its assets is not being sold. In the case that we are selling the company then please speak directly to your broker about how to approach this. We do not include work in progress or work contracted in the asset list, we deal with this in separate section of the business information package. These assets have different values based on the stage and cycle of production and delivery of the product or service, and we negotiate the sale, transfer or how we manage these items separately from the asset sale. Q: What about items that are leased or financed? A: If the item that is leased or financed is going to be paid out and is fully unencumbered then include its market/replacement value in the asset list. If you are aiming to assign the lease and or finance agreement to the buyer as part of the sales process, then it should not be included in the asset list. Leased or financed items that are to be assigned should be documented and stated in the business package, but immediately after the asset list section. The expenses of the leased or financed items listed on the profit and loss can be added back to the earnings report if the financed item is going to be paid out. This is because this finance expense will not apply to the incoming owner. Q: Can we update the asset list during the marketing campaign? A: Yes, most definitely and we encourage it. As the list will form part to the business for sale, we advise that you regularly update send through us so we can update your business sales package. If you require any assistance in preparing your asset list, please contact your business broker or designated business information package writer. When completed please email to sales@capitalcommercial.com.au. An example of an asset list completed by a seller. When we buying a business how are employees and their entitlements dealt with? The sale of a business can trigger the end of the employer/employee relationship between the seller of the business and its employees. Usually the sale and purchase of a small business is between the seller acting as a sole trader or proprietary limited company and a buyer with the same structure. By virtue of the structures, employees will have to transfer from the seller to the buyer, and enter into new employment arrangements. When a business is sold, it is common practice to terminate the employment of all of the employees prior to completion of the sale and for the seller to pay-out all employee entitlements. The seller can also provide the employees with notice that the business has been sold, and that their employment with the business will be ending on a particular date, they may then be transferred to the buyer. Subject to the terms of the sale agreement, generally the seller is required to pay the employee entitlements, including annual leave, sick leave and long service of all employees prior to completing the sale of the business. In this regard a buyer will most likely require notice that all employee entitlements have been paid to the employees under any award of employment or pursuant to their employment contracts. Notwithstanding if the employees are terminated, if they are ‘re-employed’ by the buyer of the business within 3 months of the transfer of the business, and continue to work in substantially the same role, and the buyer has substantially the same use of the assets of the business, they can be considered transferring employees pursuant to section 311 of the Fair Work Act 2009. This means if the employee entitlements are not dealt with appropriately in the sale agreement, the buyer of the business can be liable for the payment of all of the employee entitlements, including any outstanding entitlements, and unfair dismissal rules, as the employment relationship is deemed to be a continuing employment relationship, not a new employment relationship. However, a buyer can choose to not recognise redundancy and in some cases not take on liability for long service leave or employee rights in regard to unfair dismissal. You should speak with your lawyer to clarify the employment arrangements in this regard. The buyer provides notice to the employees that it will not be recognising some of the employee entitlements after the transfer of the business has occurred (should be avoided). So, when a business is sold, and the buyer has use the beneficial use of the assets of the business (the business is operate substantially the same), the employees will be dealt with in accordance with section 311 of the Fair Work Act 2009. It will be important to understand exactly what the sum of the employee entitlement are prior to settlement, and be clear on how and who is liable to make payment for the employee entitlements. If the business has a property lease and that lease must be transferred or assigned to the new business owner who is responsible for managing the process of lease transfer/assignment? When a business is sold that is operated from a premises, the lessor will first have to agree to accept the buyer as the tenant of the premises. The lessor will then deal with a transfer of the existing lease from the seller to the buyer, or provide a new lease to the buyer. Generally the solicitor acting for the seller will contact the lessor’s solicitors to advise that the business of the seller is being sold, the lessor’s solicitors will advise their client, the lessor may ask for financial or other information in relation to the buyer before agreeing to accept the buyer as the tenant. If they are agreeable, depending on the current tenure, an assignment of the existing lease, or a new lease will be provided. Generally the buyer will pay the legal fees for the assignment of lease or new lease, however, this process can be addressed during the negotiations for the sale of the business and sometimes shared equally between seller and buyer. We have reviewed the Business Information Package and we have additional questions and require more information? We understand that buyers want questions answered and relevant information provided. We are committed to doing our very best at getting the relevant information to our customers and facilitating the answers to their questions. Once you have read the Business Information Package (BIP) if you require further information or have questions, please email sales@capitalcommercial.com.au. Our system files previously asked and answered questions about particular businesses and types of business, so we might have the answer your looking for. We don't provide the detailed information, like Financials and Tax Returns with the initial BIP email that we send buyers, but rather summaries of the key components of the business. So if you require the supporting documents we may be able to provide if they exist. If we don't have them on file, then we can request the seller to provide. We do encourage sellers to provide as much information as possible to buyers, with the understand and commitment from buyers it's provided confidentially and sensitively and should be handled with care and discretely. We would like to make an offer/submission on a business that you have for sale. What is the process? Congratulations you are one step closer to owning your own business. We need to get some paperwork out of the way. At Capital Commercial Business Sales we like to receive offers from our buyers in writing. We have an easy to use and straightforward template that we ask buyers to complete and return. To receive the Offer to Own Template email sales@capitalcommercial.com.au requesting a copy and we will email it to you directly. Some relevant information that we will ask you to provide when you are completing your offer. Stock Terms (how you are proposing to purchase the stock at value): only applies to business with SAV. How you propose to fund the purchase? Outstanding questions or information requests? Once you have completed the offer form, please email to sales@capitalcommercial.com.au or fax to 1300 793 950. If you would like to place the offer face to face, we can arrange to meet at our offices in the Melbourne Building Canberra City. Please email your request or call 1300 793 690. What�s a fair estimate of what my legal fees should be if I buy a business? Businesses purchases come in all types and sizes, and so do lawyers, law firms and legal services. Hiring a good lawyer is very important because they can have a great amount of input over the success, or lack of success in purchasing a business. Careful selection of the right lawyer to guide you through the process of buying a business is critical. Depending on the nature of the sale and purchase of the business, you should expect to spend between $2,000.00 to $10,000.00 for a lawyer to assist you with the purchase of a business. If you are purchasing a small business that is not located in a premises under a lease, then legal costs will be around $2,000. If the business is operated from a premises and is subject to a lease, then costs will usually increase as the premises lease will either have to be assigned to you as new tenant, or a new lease provided by the landlord for you as the new tenant. It is common practice that the buyer pays all costs associated with the assignment of the lease, or for a new lease to be prepared, in this regard, depending on who the landlords solicitors are, expect to pay from $1,800.00 to $3,500.00 for legal fees to deal with the premises lease. If you are buying a franchised business, legal fees will invariably increase. Your lawyer will be required to read a franchise agreement and the disclosure statement, then provide you with advice on the franchise documents – these documents can be complex legal contracts and require careful consideration prior to you entering into the contract to purchase the business. In this regard you should expect to pay from $3,000.00 to $5,000.00 to deal with the purchase of a franchised business. Though the costs of retaining a lawyer may appear to be high, it is highly recommended that you do not deal with a complex business purchase without the assistance of a commercial lawyer that practices in the area of business purchases. In regard to legal fees, you should always ask your lawyer for a quote - you can negotiate the legal fees and ask for a fixed fee quote. Can you please provide a list of business bankers/lenders that can assist obtaining finance for a business purchase? Business banking specialising in business sales Canberra 2015. Please find the below contact list of Business bankers and lenders that other clients and customers of Capital Commercial Business have used in the past. Please note we are not accountable for the service provided by the individuals or firms outlined below. You may provide information provide by our office, to your financiers, under the condition that it doesn’t conflict with the signed deed of confidentiality agreement and disclaimers provided and willingly entered into by yourself. How do I acquire a tobacco licence in the ACT? Is this transferable when I buy a business? How much does it cost? What the licence authorises the holder to do: This licence is required in order for a proprietor to offer Tobacco products for retail sale. The licence enables you to sell tobacco products, such as cigarettes and cigars, at the premises specified in the licence. Licence classes: Retail and Wholesale tobacco licence. Transfer process: This licence is not transferable. How do I acquire an RSA? Is this transferable when I buy a business? How much does it cost? What the licence authorises the holder to do: Authorizes the proprietor to sell and serve alcohol. Licensees are required to have successfully completed an ACT approved responsible service of alcohol (RSA) training course. RSA training will be required every three years if you are a licensee. RSA courses are provided online and are generally inexpensive and quick to complete. How do I acquire ASQA registration? Is this transferable when I buy a business? How much does it cost? Becoming registered as a registered training organisation (RTO) is a complex process. As a deliverer of nationally recognised training, each RTO must meet a range of mandatory requirements to ensure that it can deliver training and assessment to the high standards expected by students, and by Australian industry and employers. Your initial registration application will undergo a rigorous assessment process to ensure your organisation is able to comply with (and remain compliant with) the required standards. On average, applications for initial registration take between seven and nine months to assess (see FAQ)—if you are fully prepared to become an RTO and if you have submitted a complete application to ASQA. be prepared to demonstrate the financial viability of your organisation. Application lodgement fee: is $800 per application. Vocational Education and Training Regulator Act 2011. This includes a comprehensive risk assessment and (in most circumstances) an audit of one or more of your delivery sites. This base fee covers registration for up to four qualifications (including accredited courses), 20 individual units of competency, and up to two delivery sites. The person or corporation must gain approval from ASQA to extend its scope of registration to cover any additional accredited qualifications it wishes to deliver after the sale or transfer. If the person or corporation to whom the RTO is sold or transferred is not an RTO prior to the sale or transfer: The person or corporation must apply for initial registration, and ASQA must approve the application, before the new owner can operate as an RTO. How do I acquire an infection control licence in the ACT? Is this transferable when I buy a business? How much does it cost? A floor plan showing the layout of all fixtures and fittings of the premises must accompany this application. This licence is transferable. The proprietor must complete and submit an application to transfer the Infection Control Licence. How do I acquire an outdoor dining permit? Is this transferable when I buy a business? How much does it cost? What the licence authorises the holder to do: An Outdoor Dining Permit ensures that all cafes and restaurants with outdoor dining areas on public land are appropriate and suitable for patrons, businesses, the public and the community at large. If you are a business intending to place non-fixed or semi-fixed objects in an outdoor dining area, you need to apply for a permit through Access Canberra. There is no requirement for a Development Application (DA) unless there is a proposal to construct permanent fixtures on the site. The application process - gathers general information about the business, the location, hours of operation and the business owners. The assessment process - ensures all safety checks are undertaken for both you as a business owner and for pedestrians. These checks also ensure that utilities (above and below ground) can continue to be accessed and that the public has access to open space facilities such as bubblers, bike storage areas and bins. Please note: If you plan to sell alcohol in the outdoor area and do not have a current liquor license, please contact the Access Canberra before submitting an outdoor dining permit application. Fees: this is contingent on a variety of factors, e.g number of chattels, whether or the business serves alcohol etc. and fees may vary. Forms (online): Application for outdoor dining permit. The current permit holder must apply to transfer the permit to the proposed new permit holder. If the proposed new permit holder is a company, a separate applicant details page of this form must be completed by each company director. If the proposed new permit holder is a partnership, a separate applicant details page must be completed by each partner. How do I acquire a building licence in the ACT? Is this transferable when I buy a business? How much does it cost? Licence type: Builder licensing (Class A, B C or D). Building work other than specialist building work or handling asbestos. This licence permits building work of unlimited height on any Building Code of Australia (BCA) class of work. Non-structural basic building work, other than specialist building work or handling asbestos. Unless the assessment timeframe has passed, or a more information request has been sent, licensing will not be able to discuss an application. For an application to be deemed lodged you must pay the application fee of $473.00 (if lodged at an Access Canberra customer service shopfront) or $430.00 if lodged online. This application fee is non-refundable should you not be successful in obtaining a licence. If the licence application is successful you will be contacted to pay a licence term fee. How do I acquire a motor vehicle repairer licence in the ACT? Is this transferable when I buy a business? How much does it cost? giving advice on any of the work mentioned above. Forms and fees: You may apply for a motor vehicle repair licence by completing an Application for a motor vehicle repair licence (Online) and paying the prescribed fee. Before lodging your application it is important that you have obtained all the necessary planning and other approvals. These may vary depending on individual business circumstances, but generally around $310 per annum. Transfer process: This is not transferable. If you are selling your motor vehicle repair business the proposed purchaser must apply for a new licence. It cannot be assumed that they will automatically receive a licence as the eligibility tests must still be met for the proposed new owner. How do I acquire an electricians licence in the ACT? Is this transferable when I buy a business? How much does it cost? What the licence authorises the holder to do: Type of work one can undertake depends on the class. Assessments of a licence/accreditation/registration application for an individual, company or partnership, will take a minimum of four weeks for processing if the application is complete. If an application is incomplete, or a delegate requires more information or verification of experience, the assessment of an application can take considerably longer. More information requests will be sent to an applicant by email in the first instance. Assessments of applications will not be fast tracked in any circumstances. Ensure that the assessment timeframe is taken into consideration when planning to undertake work requiring a licence/ registration in the ACT. Unless the assessment timeframe has passed, or a more information request has been sent, licensing will not be able to discuss an application. Costs: For an application to be deemed lodged you must pay the application fee of $250.00 (if lodged at an Access Canberra customer service shopfront) or $228.00 if lodged online. This application fee is non-refundable should you not be successful in obtaining a licence. If the licence application is successful you will be contacted to pay a licence term fee. Transfer process: This is not transferable. 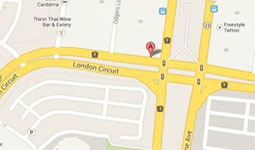 How do I acquire a liquor licence in the ACT? Is this transferable when I buy a business? How much does it cost? Applicants applying for a new liquor licence must also undertake a public consultation period for 30 days, by having a notice published on the ACT Open Government website and displaying a sign (which will be provided to you upon application) at the proposed premises. The person who wishes to take on the licence must fill out the form and the current licenses or authorised person must sign on a section of the application agreeing to transfer. When the application of transfer is received the department reviews the application and generally approves if all required documentation is included and is correct. Then the liquor licence is passed to the new vendor who is now licenced to sell liquor. How do I acquire a food business licence in the ACT? Is this transferable when I buy a business? How much does it cost? Registration applications must be accompanied by plans and specifications of the food premises and an Application for Fit-out and Plan Assessment for consideration by a Public Health Officer. An inspection will be carried out before a new registration can be granted. Once the business is deemed to have met the requirements of the Food Standards Code and the Food Act 2001 a registration certificate is issued. Forms and fees: please see the Registration Information Sheet below to find out which category your business falls under. This licence is transferable. The proprietor of the business must advise the Health Protection Service within 7 days of a change in ownership of the business. The vendor must complete the Health Protection Service Food Business Application to Vary or Transfer Registration form. The landlord and or other parties associated with the sale have asked us to prepare documents such as a business plan and statement of assets and liabilities. Can you provide templates? Yes please see the attached templates. Business Plan Template: You can find a reliable and practical business plan template here at the business.gov.au website. https://www.business.gov.au/info/plan-and-start/templates-and-tools/business-plan-template-and-guide?sc_camp=5CF4404F78FC4A0EAE788B87D3C8A15D&gclid=CNzE1erBqNQCFZQIKgodF0EO7w&gclsrc=aw.ds . Much on the information required to complete this business plan will be will provided with the Business Information Package provided for your relevant business. Personal Assets and Liabilities (version 1). Often landlord will ask for a statement of assets and liabilities. This is an easy to use dashboard. How do we place a holding deposit with Capital Commercial Business Sales? Please download the attached form. A record of all short-term (less than 12 months) invoices, bills and other liabilities yet to be paid. Examples of accounts payable include invoices for goods or services, bills for utilities and tax payments due. A record of all short-term (less than 12 months) expected payments, from customers that have already received the goods/services but are yet to pay. These types of customers are called debtors and are generally invoiced by a business. An accounting system that records transactions at the time they occur, whether the payment is made now or in the future. The process of expensing for intangible assets such as goodwill and intellectual property over a period of time. See also Depreciation. Are things you own. These can be cash or something that can be converted into cash such as property, vehicles, equipment and inventory. A physical check performed by an auditor or tax official on a business' financial records to check that everything is accounted for correctly. Money owed to you that is unlikely to be paid to you in the foreseeable future. A snapshot of a business as of a particular date. It lists all of a business' assets and liabilities and works out the net assets. A final lump sum payment due on a loan agreement. Loans with a larger final 'balloon payment' have lower regular repayments over the term of the loan. A cross-check that ensures the amounts recorded in the cashbook match the relevant bank statements. A process where an individual is legally declared bankrupt and their assets and financial affairs are administered by an appointed trustee. A set of conditions against which a product or business is measured. The process of comparing your business to similar businesses in your industry. A legal document used in the purchase of property or other assets that details what was purchased, where the purchase took place, and for how much. The process of recording the financial transactions of a business. Where a business funds growth purely through personal finances and revenue from the business. The exact point when a business' income equals a business' expenses. A listing of planned revenue and expenditure for a given period. Wealth in the form of money or property owned by a business. A one-off substantial purchase of physical items such as plant, equipment, building or land. Is the amount gained when an asset is sold above its original purchase price. Includes all money that is available on demand including bank notes and coins, petty cash, certain cheques, and money in savings or debit accounts. An accounting system that records transactions at the time money is actually received or paid. A daily record of all cash, credit or cheque transactions received or paid out by a business. Money that is flowing into the business. Money that is flowing out of the business. An index of the accounts a business will use to classify transactions. Each account represents a type of transaction such as Asset, Liability, Owner's equity, Income, and Expense. Is similar to a hire-purchase agreement although the business owns the asset from the start. Chattel mortgages require regular ongoing payments and typically provide the option of reducing the payments through the use of a final 'balloon' payment. (Also known as a bill of exchange) is a form of commercial loan that can be offered on an interest only basis, or reducing basis. Commercial bills typically require some sort of security and suit short-term funding needs such as inventory. A liability that only needs to be paid if a particular event or circumstance occurs. The total direct costs of producing a good or delivering a service. A lending term used when a customer purchases a good or service with an agreement to pay at a later date (e.g. an account with a supplier, a store credit card or a bank credit card). A report detailing an individual's or business' past credit arrangements. A credit history is often sought by a lender when assessing a loan application. A dollar amount that cannot be exceeded on a credit card or the maximum lending amount offered for a loan. A person or business that allows you to purchase a good or service with an agreement to pay at a later date. A creditor is also anyone who you owe money to, such as a lender or supplier. Is a way of financing your business idea through donations of money from the public. This is usually done online, through a crowd funding website. An asset in cash or that can be converted into cash within the next 12 months. A liability that is due for payment in the next 12 months. In double-entry bookkeeping a debit is an entry made on the left hand side of a journal or ledger representing an asset or expense. Any amount that is owed including bills, loan repayments and income tax. The process of combining several loans or other debts into one for the purposes of obtaining a lower interest rate or reducing fees. Money provided by an external lender, such as a bank or building society. A person or business that owes you money. A failure to pay a loan or other debt obligation. The process of expensing an asset over a period of time. An asset is depreciated to spread the cost of the asset over its useful life. Money that is paid out by a business. A reduction applied to a full priced good or service. See also Markdown. Is a bookkeeping method that records each transaction in two accounts, both as a debit and a credit. An employee share scheme (ESS) is where you give your employees the opportunity to buy shares in your company. It is also known as an 'employee share purchase plan' or an 'employee equity scheme'. An encumbered asset is one that is currently being used as security or collateral for a loan. The value of ownership interest in the business, calculated by deducting liabilities from assets. See also owner's equity. Is money provided to a business in exchange for part ownership of the business. This can be money invested by the business owners, friends, family, or investors like business angels and venture capitalists. An indirect tax levied on certain types of goods produced or manufactured in Australia including petrol, alcohol, tobacco and coal. A predetermined arrangement such as an account offered by a financial institution to a business (e.g. a bank account, a short-term loan or overdraft). (Also known as debtors finance and accounts receivable finance) — is when a factor company buys a business' outstanding invoices at a discount. The factor company then chases up the debtors. Factoring is a way to get quick access to cash, but can be quite expensive compared to traditional financing options. Money used to fund a business or high value purchase. A summary of a business' financial position for a given period. Financial statements can include a profit & loss, balance sheet and cash flow statement. A twelve month period typically from 1 July to 30 June. A physical asset used in the running of a business. A cost that cannot be directly attributed to the production of a good or service. When the interest rate of a loan remains the same for the term of the loan or an agreed timeframe. Is when a private company offers shares in the company to the public for the first time. See Initial public offering. A prediction of future financial transactions. Forecasts are often used to help plan a more accurate budget. Non-monetary benefits such as company cars and mobile phones, included as part of a salary package. Is a long term loan with the option to fix the interest rate for a period. These loans are usually secured and can be used to fund a new business or equipment. An intangible asset that represents the value of a business' reputation. The total money earned by a business before expenses are deducted. (Also known as net sales) the difference between sales and the direct cost of making the sales. A person who promises to pay a loan in the event the borrower cannot meet the repayments. The guarantor is legally responsible for the debt. A type of finance contract where a good is purchased through an initial deposit and then rented while the good is paid off in instalments plus interest charges. Once the good is fully paid the ownership of the good transfers to the purchaser. See also Rent to buy. When a company first offers shares on the stock market to sell them to the general public. Also known as floating on the stock market. A business or company is insolvent when they cannot pay their debts as and when they fall due. Non-physical assets with no fixed value, such as goodwill and intellectual property rights. The cost of borrowing money on a loan or earned on an interest-bearing account. A percentage used to calculate the cost of borrowing money or the amount you will earn. Rates vary from product to product and generally the higher the risk of the loan, the higher the interest rate. Rates may be fixed or variable. An itemised list of goods or materials a business is holding for sale. An asset purchased for the purpose of earning money such as shares or property. A document provided to a customer to request payment for a good/service received. See our Payments and invoicing topic. Is finance offered based on the strength of a business' accounts receivable. This form of financing is similar to factoring, except that the invoices or accounts receivables remain with the business. See also Factoring. A financial obligation or amount owed. To quickly sell all the assets of a company quickly and convert them into cash. The process of winding up an insolvent company. An appointed administrator will do this by ceasing business operations, selling assets, and paying creditors and shareholders. A finance agreement where a business borrows money from a lender and pays it back in instalments (plus interest) within a specified period of time. The difference between the selling price of a good or service and the profit. Margin is generally worked out as a gross margin percentage which shows the proportion of profit for each sales dollar. See alsoMark up. When the value of a property or asset falls below a certain LVR. For higher risk loans such as margin loans, the lender will request further payment to bring the LVR back to the agreed percentage. See also Loan to value ratio (LVR). A discount applied to a product during a promotion/sale for the purposes of attracting sales or for shifting surplus/discontinued products. See also Discount. The amount added to the cost price of goods, to help determine a selling price. Essentially it is the difference between the cost of the good/service and the selling price, but it does not take into account what proportion of the amount is profit. See also Margin. When a loan's term ends and all outstanding principal and interest payments are due. (Also known as net worth, owner's equity or shareholder's equity) is the total assets minus total liabilities. The total money earned by a business after tax and other deductions are taken out. (Also known as your bottom line) is the total gross profit minus all business expenses. A credit account that has exceeded its credit limit or a bank account that has had more than the remaining balance withdrawn. The fixed costs associated with operating a business such as rent, marketing, utilities and administrative costs. See also Fixed costs. Covers any property someone can own, except for land, buildings and fixtures. Examples include goods, plant and equipment, cars, boats, planes, livestock and more. The PPSR replaces a number of registers of security interests and provides a single national noticeboard of security interests in personal property. Cash for the purposes of small miscellaneous purchases such as postage. A group of fixed assets used in the operation of a business such as furniture, machinery, fit-out, vehicles, computers and tools. The original amount borrowed on a loan or the remainder of the original borrowed amount that is still owing (excluding the interest portion of the amount). The total revenue a business earns minus the total expenses. See also Revenue. (Also known as an income statement) is a financial statement listing sales and expenses and is used to work out the gross and net profit of a business. Stands for 'research and development'. Businesses conduct research and development to innovate, create new products and find better ways of doing things. A document provided to a customer to confirm payment and to confirm a good/service has been received. The process of keeping or recording information that explain certain business transactions. Record keeping is a requirement under tax law. When a new loan is taken out to pay off an existing one. Refinancing is often done to extend the original loan over a longer period of time, reduce fees or interest rates, switch banks, or move from a fixed to variable loan. Is a type of finance arrangement where a good is purchased through an initial deposit and then 'leased' while the good is paid off. Once the good is fully paid the purchaser has the option (but no obligation) to buy the good or continue leasing. See also Hire purchase. A type of clause that can be included in contracts where a buyer may physically receive property, but doesn’t take legal ownership from the seller until the full purchase price is paid. A calculation that works out how efficient a business is at generating profit from the original equity provided by the owners/shareholders. It's a way of thinking about the benefit (return) of the money you've invested into the business. To calculate ROI, divide the gain (net profit) of the investment by the cost of the investment - the ROI is expressed as a percentage or a ratio. (Also known as turnover) the amount earned before expenses, tax and other deductions are taken out. A deliberate and targeted deception designed to obtain money or information unlawfully. See our Business scams section. (Also known as Collateral) is property or assets that a lender can take possession of, in the event that a loan cannot be repaid. A bookkeeping method used within a cash accounting system and records one side of each transaction. Stands for self-managed superannuation fund. An SMSF is a way of saving for your retirement. Unlike other super funds, an SMSF is self-managed, which means you're responsible for making sure the super fund complies with super and tax laws. A regular process involving a physical count of merchandise and supplies actually held by a business, completed to verify stock records and accounts. Money set aside for retirement, that must be paid into a complying superannuation fund. An invoice required for the supply of goods or services over a certain price. A valid tax invoice is required when claiming GST credits. See also Invoice. A cost that changes depending on the number of goods produced or the demand for the products/service. When the interest rate of a loan changes with market conditions for the duration of the loan. Capital invested in a start-up business that is thought to have excellent growth prospects but does not have access to capital markets because it is a private company. The cash available to a business for day to day expenses.